Today I’m welcoming David LeRoy to my series of author interviews. David is the author of The Siren of Paris. 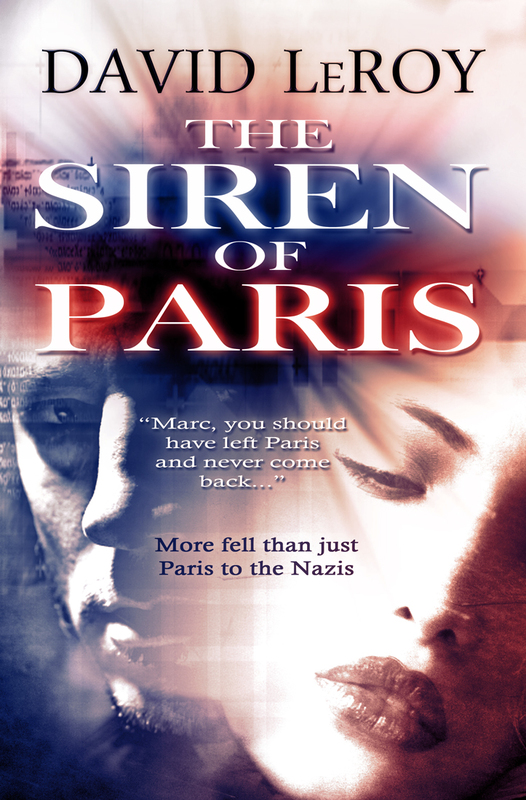 A: The Siren of Paris is a story of survival of World War Two, told primarily in the point of view of a young French born, American male who returns to Paris to study art in 1939. World War Two broke out on Sept 1st, 1939. What many do not know is that at that time there were over 30,000 Americans in Paris alone. After Sept 3rd, they would have a terribly tough time getting home, because the Germans sank a British Passenger ship, the RMS Athenia, killing 98 passengers, and 19 crewmen. Nearly all trans Atlantic service stopped after the sinking which trapped many Americans in Europe during the war, including this young student. Q: Sarah’s Key, I believe is during the same time period. Is Marc Jewish? Is that how he ended up in Buchenwald in the story? A: Sarah’s Key is during the same time period, but unlike the young girl Sarah, who is Jewish and caught in the round up during 1942, Marc is Catholic. You would think that this would be something of a protection, but that is not the case. Marc ended up in Buchenwald because he was caught up in the arrest of a ring of various Paris underground resistance members in the spring of 1944. The Gestapo and Milice had hired thousands of plain-clothes undercover agents to smoke out the Paris underground, and tragically they were immensely successful. Paris was liberated in the summer of 1944, but at the same time, members of the resistance were being shipped east to concentration camps. The program was called “the fog and the night,” meaning that anyone who resisted the Nazis were sent someplace where they simply disappeared. A: The Siren of Paris is packed with historical figures and facts of the time period. Better-known figures are Ambassador William Bullitt, Under Secretary Sumner Wells, Sylvia Beach of Shakespeare and Company, and Jacques Lusseyran. There are also lesser-known individuals such as Joan Rodes, know as the Angel of Saint-Nazaire, and Drue Tartiere, another American woman who helped with the underground. The unfortunate victims of the RMS Lancastria sinking on June 17th, 1940 are also within this story. Researching for this book was incredibly challenging. I have books in English, French and even a few in German. One book I have told me district by district in Paris of Nazi collaborative activities, and buildings taken over by the Germans. I tried to incorporate the real events of the time, whenever possible without the text feeling like a history book instead of a dramatic story. Q: What is the RMS Lancastria? How did Marc get on that ship? A: The fall of France was a terrifying event. About 10 million people evacuated from the North to the South of France as the German Army swept over the country. Nearly all the roads became clogged with abandoned cars that had run out of petrol, and refugees feeling on foot. Marc became swept up in this hoard of refugees and he boards the ship with a group he was traveling with. He was trying to get back over to England so he could go up to Ireland and catch an American ship home. At the time, American ships would only leave from neutral countries, which made the task of getting home even more difficult. Most of the passengers were from the British Expeditionary Force, but the ship took on civilians along with soldiers. It is estimated the ship took, in all, about 9,000 refugees. Most people do not know of the sinking because the British Government suppressed it during the war. To date, it is the single largest loss of life of any British Ocean liner and still one of the few war wrecks that is not recognized formally by the British Government. Q: You chose to self-publish your novel as an e-book. Can you tell us how you came to that decision? A: When I started writing, I had every intention of publishing it through a traditional publisher. It seems like the entire world of publishing is changing daily. The success of many authors in 2011 with self-publishing changed my opinion, and I began to consider self-publishing over a traditional publisher. It is still a lot of work. The most recent events with the DOJ have convinced me that I honestly do not want to sign a contract at this time with an agent or publisher. I can’t imagine signing a long-term contract now with all of the uncertainty out there in the market. Self-Publishing has evolved to the point that it has become a particularly attractive option. Honestly, five years ago I would never have considered Self Publishing, and the way things are going, in five more years this will not even be a question. Q: So, who is the Siren? A: You will have to read the book. Do not be so sure you know who the Siren is too early. A: I have a day job in the world of communications. My other passion is art. It was the reason I went to Europe back in 2010, and discovered the facts around this story. I was studying the artwork of various European modern artists. For the longest time, I was into large format black and white photography. Then one day, it just was not enough anymore, so I took up drawing and painting. Coffee or tea? I drink too much coffee and should drink tea. Ocean or mountain? Ocean, but my friends love the mountains. Hiking or shopping? Urban Hikes, through malls, or REI, where I can make believe I am hiking as I shop. Violin or piano? I am in recovery from a classical Piano background. Mystery or fantasy? There is a difference? I didn’t know. Hester Prynne or Scarlet O’Hara? Hester Prynne, as a secret lover to Scarlet O’Hara. Love scene or death scene? Love leads to death, and death of self, leads to love. They are the one and the same. 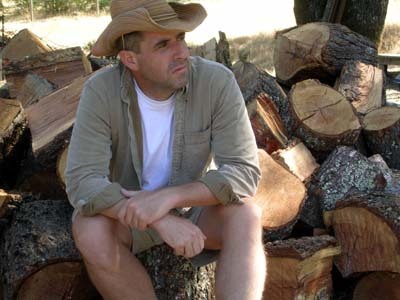 To learn more about David LeRoy, visit his webpage. You can buy his book here. The blog post that gets looked at the most is the one I wrote after dyeing my hair with henna the first time. That was written about a year and a half ago, and I’ve learned a lot since then, and thought I would share that information. First, let me note that I’ve only used Light Mountain Natural Henna products. I’ve not been paid by that company to write this blog. It is the only henna product I’ve tried. Others might be just as good, better, not as good—I don’t know. My intent in dyeing my hair is to hide the gray. The first few times I used henna, I was not successful in that goal. The henna seemed to slide off the gray hairs a few days after dyeing. Doing a little research, I discovered that there are henna products made especially for hiding the gray, and I switched Light Mountain Natural’s Color the Gray (light brown)! Next, you mix the second packet, let it cure, apply it, let it sit, rinse it out. 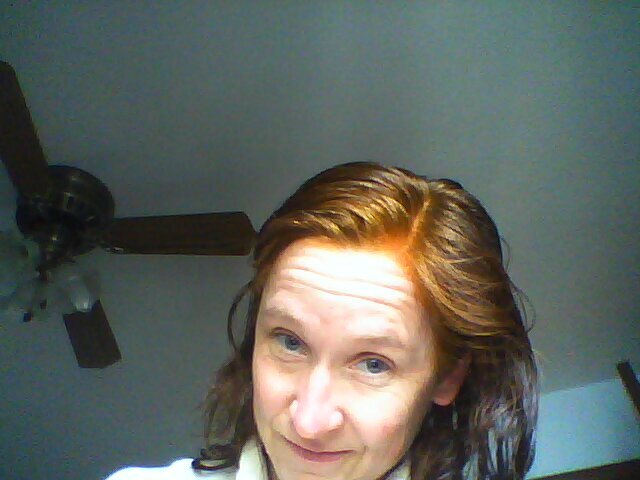 This second henna dye covers the orange and makes my hair uniformly light brown with reddish highlights (which is pretty close to my original color). I’ve been extremely happy with the results. Drawbacks: This whole process usually takes about three hours, and then I can’t wash my hair for another 12 to 24 hours. (Forget swimming, which I try to do regularly). I almost always get a crick in my neck because of the difficulty of applying the dye. Advantages: Huge money savings. Each package of dye contains a lot of dye. At first, I used one package for a dyeing, but I had a lot left over. After awhile, I decided to divide the packages in half, use half and save the rest in a plastic baggie for the next time, and I still had plenty of dye. I have quite a bit of hair, too. After doing that for a number of months, I now divide the packages into thirds. This seems to be the perfect amount of dye for my shoulder-length hair. The product I buy costs $7; that’s $2.33 per dye. A lot less than the $70 I used to pay at the salon. And, of course, the henna is plant-based and doesn’t make me sick, which the chemical dyes did. Don’t worry about getting the dye on your forehead, ears, fingers, etc. You need to get it close to the scalp to cover the gray, and I’ve found that the dye washes off my skin easily. 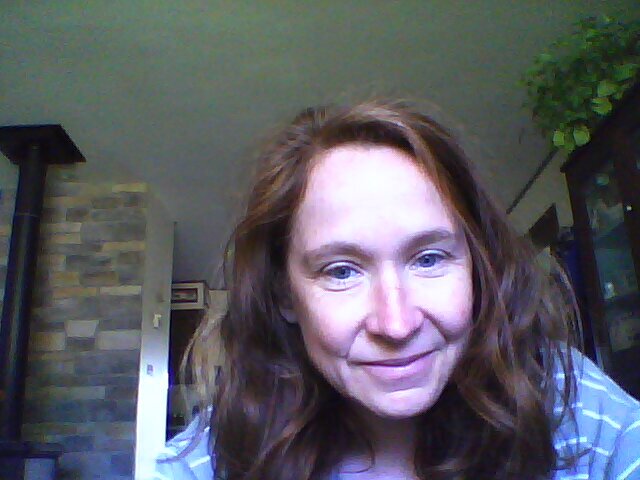 That said, I have fair skin that is still (at age 46) extremely oily, so I can’t promise this will be true for everyone. Save plastic shower caps from hotel rooms to use to cover your hair. The plastic head covering that comes with the box isn’t very good. Those are all the tips I can think of right now. If you have any questions, ask them in the comment section below, and I’ll answer to the best of my ability. 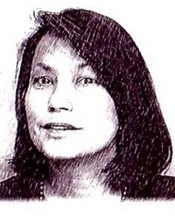 Today I’m welcoming Debra Brown to my series of author interviews. 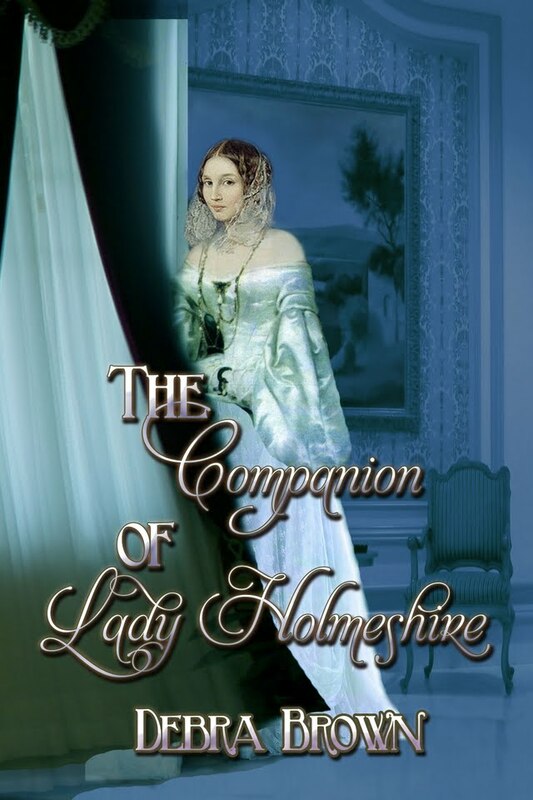 Debra is the author of The Companion of Lady Holmeshire. A: Sure! In about 1820 England, Emma was found and raised by a squire and then sent to work as a servant in the household of the Countess of Holmeshire. The widowed lady chose her as a companion and sent her for training in the ways of gentility. Emma was then dragged along into polite London society, where she received a rude reception. She had eyes for the young Earl of Holmeshire, but he was out of her class and engaged by arrangement. The story has elements of suspense and sweet romance. Q: How much historical fact is woven into The Companion of Lady Holmeshire? A: Some historical persons are mentioned, such as Caroline, Princess of Wales and her daughter Charlotte of Wales, as well as Queen Victoria. Everything mentioned about them in the book is fictional, but based on historical truth. Q: What made you interested in this time period? A: It started in my childhood with, believe it or not, Nancy Drew mysteries. I read them all, but all I really remember is a picture in my mind of Nancy Drew in an old Victorian house. Over the years there were other novels and movies that I loved- all historical fiction and pretty much English. When it comes to movies, I just don’t have much interest in anything but period drama. Q: What moved you to start writing? A: I had both a day job and a jewelry business. In the evenings, I would watch period movies and make jewelry. During the recession, my job ended and my business slowed down drastically. But the real crisis was that I ran out of movies! I thought it would be fun to write something like the Jane Austen stories, and so I did, starting as just a hobby. I’m happy to say that my book has a four star rating- so I guess most of my readers didn’t realize I was writing just for fun! Q: Do you have another book in the works? A: Yes, I do. It has a working title of For the Skylark. It is about some young adult twins who have been raised on an estate by their mother, a strange and mysterious woman based on Charles Dickens’ Miss Havisham. She has secluded them from society, and they pretty much just have each other, as she spends her time in an attic-dome and the servants are not allowed to chat with the children. They live by a set of strict household rules. The story starts as the young man starts to want to see the outside world- and his sister wants to prevent that. She has been content and feels that they must leave well enough alone. Q: Are your books part of a series? A: Companion is not. Skylark is intended to be the beginning of a series. I can hardly wait to start on the next one! And who knows, I might have them meet the Holmeshires someday. Q: What do you do to promote your books? A: I was lost in the beginning, to be perfectly honest. I had a publisher, but I knew I needed to do more. I set up a Facebook profile and learned to use Twitter, and through that I became acquainted with other authors, and I began to see how they promoted their books. I started blogging, and later started a multi-author blog called English Historical Fiction Authors. Our goal is to have a new historical post every day, and so far we have done so since our launch on Sept. 23rd, 2011. We have a great group on Facebook where we chat with readers and other authors. Join us there! Q: Enough of your book: tell us about yourself. A: How boring is that! Well, I grew up in Minnesota and then the San Diego area. I went to nursing school and then spent years raising children and being too sick to work. During those years, I studied homeopathy and art, and I got my health back. I enjoy oil painting and all kinds of creative pursuits, but I must admit to being tired of making jewelry, at least for now. Writing books has been a great joy, and I really have gotten to know some wonderful people through this pursuit. Green tea, thank you, since coffee causes my eczema to flare up. Ocean. Could I have a clipper ship please? Shopping and out to eat. Thanks so much for the interview, and for all who came to read!